The places we visited during this trip are tucked away quietly amidst the lap of the Himalayas, far from the crowds and rituals of modern day temples. With advancing times, many siddha places have not remained protected from the onslaught of tourists. Yet some places remain silent and unnoticed, as destined by Providence. I strongly believe that one can only get to these places when the divine call comes. No map or planning will lead you there. Such has been my experience. I consider, and rightly found, myself blessed on visiting these places. For obvious reasons, I will give everyone an idea of the locations, but leave it to the reader to follow their own beckoning and visit the places, if it be the will of the Divine. After a long flight from US, I landed in Delhi at about 6.30 in the morning on 19th July. The very next day we set out on our journey in the Himalayas. Father and I made a night stop at Haridwar to drop my mother off at Jolly Grant where my Mamaji is a doctor at HIMS (Himalayan Institute of Medical Sciences) established by Swami Rama. The next day, we left for Lansdowne located in the Garhwal range of Himalayas. Starting early, we left Haridwar at 8.30 after a heavy breakfast of Poori Bhaaji. We encountered Kawariyas during most of our journey through the plains of Uttar Pradesh and Uttarakhand. 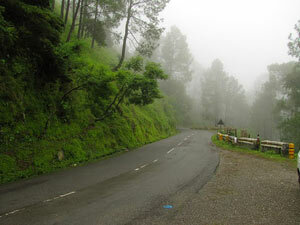 The scenery became hilly as we approached Kotdwar, which is a small and bustling town 130 kms from Lansdowne. We arrived at the outskirts of Lansdowne at about 1.30 pm. We decided to stay away from the populous areas and halted at Kasang Regency Hill Resort, 5 kms outside Lansdowne. After enjoying a panoramic view of the Himalayan mountains from our room's balcony, and having imbibed a decent lunch, we set out for our destination: Tarkeshwar Mahadham. 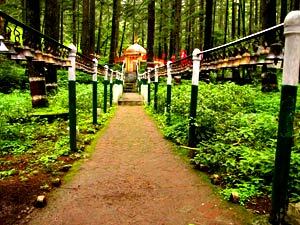 This is a 600-year old sacred shrine located on a hill-top nestled within a deep forest at about 6,800 feet above sea level. 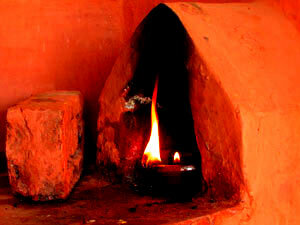 The ancient Tarkeshwar Dham is also where Swami Rama of the Himalayas is said to have attained enlightenment. Here Swami Rama and his master would come often for Tapa. Amazingly, the wild animals ambulating about are quite indifferent to any human inhabitant, as Swami Hari, also known as the Laughing Swami often found in his encounters with bears, tigers and cobras. Around February - April in 2010, during the time of the Kumbh Mela at Haridwar, I had some strange visions with one of them being of Swami Hari. Back then, I had merely read about Tarkeshwar a few times, including a reference to it in Swami Rama's book Living with the Himalayan Masters. 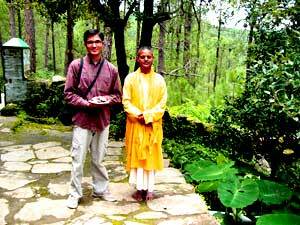 It was a surreal dream where Swami Hari and I talked about random things beside a temple in the mountains. He invited me to visit Tarkeshwar. Afterwards, the dream remained etched in my memory as if I had met Swamiji in real life. Things became more intense when a friend told me that Swami Hari had left his mortal body in June 2008, which was almost 2 years prior to my dream. I knew that Tarkeshwar beckoned strong - but it would take 2 trips to Himalayas before my Sankalpa became a reality. The road to Tarkeshwar was more or less deserted as there is no habitation along the way. We did not encounter any villages, not even a tea shop. It was definitely one of the most desolate roads I have seen in Himalayas. We saw barely 3 or 4 vehicles that passed us in the 1 hour drive of 39 kms. There were severe landslides at places and the road was narrow but being repaired constantly. The environment was serene, quiet and filled with a vibrant energy, as if the sages from time immemorial were (and probably are) still engrossed in their tapasya. The 15 minute walk to the shrine is along a narrow paved path. Before you arrive at the shrine, you pass through the meditation hall and a dharamshala on the left, located on a hillock. The entire area is surrounded by thick blue pine forests, oak trees and dense deodars. A feeling of rejuvenation enveloped us as we arrived at Tarkeshwar Mahadham. There were a few cows grazing. There was no caretaker. And no visitors, other than some lads who left within a few minutes of our arrival. My father absorbed the ambience of the environment and went his way, while I sat in dhyana at the yagna kund. As I dived deep within my psyche, I imagined Swami Rama and Swami Hari performing a yagna. After paying silent obeisance to the Siddha Bhoomi and Swamiji, we departed from the sacred shrine after an hour or so. We did remember to have a cup of hot and sweet Himalayan tea at the only tea stop located at the entrance of Tarkeshwar. I tried my utmost to capture the entire journey through my camera lens, but to drink in the vibes - one must visit the place, when the beckoning comes. There are many places throughout India, especially in the remote reaches of Himalayas where routine visitors do not step foot. 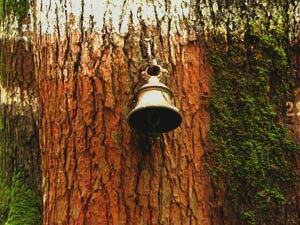 The sound of constantly ringing bells and arti will be missing. There will be no sign-boards to guide you - nor will the place be listed on any map. Such places can only be found if the Divine guides and beckons you. I learnt of Siddhashram at Sitalakhet when I read the book Sri Babaji: Immortal Yogi of the Himalayas by Romola Butalia. 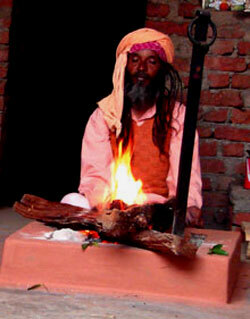 Siddhashram is associated with Hariakhand Baba or Hairakhan Baba. There are many names and spellings by which people know the Siddha Yogi. However, such siddhas are beyond name and identification. As stated in the book, "Some people refer to him as Mahavatar Babaji, from Lahiri Mahashaya's meeting in 1861, made popular by Paramhamsa Yogananda-ji's book, Autobiography of a Yogi. Others have mentioned the legendary Kripacharya, or the Chiranjeevi Ashwatthama from the days of the Mahabharata, when referring to him. He is also known as Kriya Babaji. As a perfect siddha, he has been associated with Guru Gorakhnath, also known as Shiva Goraksha." It is best to not get confused in attempting to identify who is who, but focus on the eternal truth which is ever present. In 2005, I had visited Hariakhand Baba's ashram, at Chiliyanaula, about 5 kms outside of Ranikhet, made by Bhole Baba, who was regarded by many as an avatar of Hariakhand Baba. Since then, my inner experiences have always kept me in close proximity to Babaji. I'm sure there is a divine wish behind that, which is not always easy to comprehend by our mortal minds. We left Ranikhet around 9 am on 25th July for Sitalakhet, also known/spelled as Sheetalakhet, Sitlakhet. 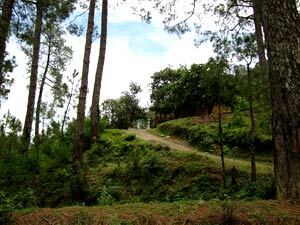 Its is a small paradise at a distance of 38 kms from Ranikhet. You will not find Sitalakhet on any map or GPS device. Just two kilometers below Sitalakhet there is the village 'Khoont', which is the ancestral village of the late Pandit Govind Ballabh Pant, the first chief minister of Uttar Pradesh and a famous freedom fighter of India. Siddhashram is not located within Sitalakhet, but one must turn off the main road before Sitalakhet. I am not drawing an exact map of the place because I believe that such sacred places can only be visited when the Divine beckons you. Then the map will automatically unfold in front of you and you will be led by an invisible force. This is what happened in our case and I trust it will be the same for you. After meandering back and forth along the narrow mountain road we discovered a slight uphill incline. Along the hill Siddhashram stood tall. There was an unmistakable silence that echoed. The unpolluted air reverberated with divinity that engulfed the place. After paying our respects at the mandir made by Babaji, and doing aarti - our host, guide, narrator and the ashram care-taker, Joshiji, invited my father and I into the main building for a hospitable cup of tea. The ground floor of this building was built during Babaji's time as the dharamshala for visiting seekers. While Joshiji attended to his duties, we sat in silence reflecting on the several artefacts and photos of Babaji as well as several others. After finishing our tea, we exchanged conversations about several incidents and legends associated with Hariakhand Baba. 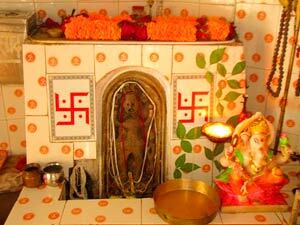 In the Kumaon hills, Baba is popularly known as Hariakhand Babaji and many tales are told about him in these parts dating back to mid 1800's. We talked about the formation of the ashram, about the sacred trees, Nar and Narayan, that stand where they were planted by Babaji in early 1900's. There is a sacred water source that flows here ever since the day Babaji Invoked mother earth to provide the locals with the nectar like water. Needless to say, the first sip of the water rejuvenated all our senses. The ancient kutir which Babaji had built for visiting sadhu-sants still stands, from the years when he himself resided at the ashram, though the kutir in which he lived is no longer there. When the ever-moving yogis and siddhas descend from the higher Himalayas, which itself symbolise those very realms of siddhas and yogis, they invoke the sacred energies present here through havan and anushthan. We spent around 3 hours at Siddhashram, and conversed with Joshiji as he took us around the ashram and spoke about Babaji. I then spoke to him of a common acquaintance, a well-known author, that added yet another surprise factor to our visit. An impromptu conversation then followed on the phone with both Joshiji and I taking it in turns to talk from Siddhashram. Does anything happen here that is not at the direction of Babaji? After a promise of a return visit soon, we took Joshiji's leave and in farewell, paid our respects to this sacred place. As a very well known author, whom I know, put it: "The time spent there was in an entirely different realm of timelessness, perfection, and infinite possibilities". On our way from Sitalakhet to our next destination, we passed through Kainchi where we had tea and paid silent respects to Neem Karoli Baba's Ashram. Sombari Baba and Hariakhand Baba often travelled and did tapasya together in early 1900's across Kumaon region of Himalayas. The region still echoes with legends about them. 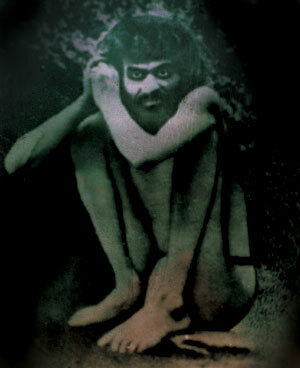 Sombari Baba was also one of the teachers of Swami Rama whose master, Bengali Baba had sent him to Sombari Baba during his early days. People began to call him Sombari Baba because he held a public bhandara (feast) in his ashram every Monday. Gudari Baba, Sombari Baba, Hariakhand Baba, were among the sages of the highest state who travelled and did tapasya in Himalayas. I believe that only by an inner urge to seek them or by divine will can one come to the point of visiting the places associated with them. Numerous tales about Sombari Baba have been told over last 90+ years and I will let the reader find their own beckoning to visit the place. As was the case with Siddhashram, the call from Sombari Baba came to my Father and was what took us to Padampuri, which was a 106 km journey from Sitalakhet. Most people I met along the way had not heard of Padampuri. 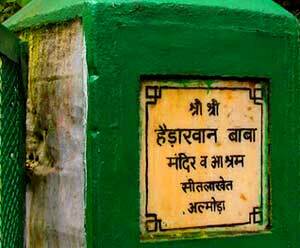 It is better known as the birth place of veteran Congress Leader, Narayan Dutt Tiwari. Padampuri is about 30 kms east of Nainital. You will need to leave Highway 87 to travel for about an hour on narrow mountain roads. Be prepared for bad roads and landslides if you travel during the rains. 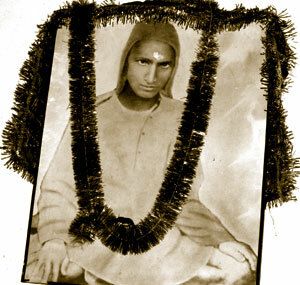 Swami Parmanand Puriji Maharaj, born in 1889 AD, was not present at the Padampuri ashram, but was living at the Palara ashram where Sombari Baba's gufa is located. Since it was almost twilight when we reached Padampuri, we decided not to proceed to Palara. That would have to be another trip, if destined. Atal Baba who stays at the Padampuri ashram when he is not at the gufa at Palara, or at one or other places of tapasya in the Kumaon Kailash kshetra, sat engrossed in front of the dhuni. He spoke at intervals about Sombari Baba, but mostly sat engrossed in another world. It seemed as if he was "half here, half there" which is often said about siddha yogis. There was a timeless environment in the small room filled with the warmth and fragrance of the dhuni and of the burning dhoop (incense). After accepting Prasad, we sat listening to stories of Sombari Baba, narrated by a local villager who was visiting. Atal Baba spoke with a mysterious twinkle in his eyes while conveying mystic messages. Towards the end of our visit, Atal Baba gave his message in yet more cryptic terms to my Father. I sat quietly and observed the divine play at large. Towards the end, we accepted his blessings, and went down to pay our respects at Sombari Baba's Samadhi, where Baba's presence is tangible.